Tuscany is preparing to celebrate the Carnival with many amusing events organized in next weeks in the main cities as well in the tiny villages of the region. From the great and famous Carnival parades in Viareggio to the events in smaller towns, such as the Carnival at Mugello in Dicomano or San Gimignano, there are a lot of funny and colorful appointments for both adults and children. Viareggio offers one of the most famous Carnival parade in Italy. Its allegorical floats in paper mache animate every year the seaside avenues of the city, well known as “La Passeggiata”. On Saturday 19 a cerimony will officially open this Viareggio Carnival 2011. The real parades will take place around 3 pm on Sunday 20 and 27 of February, March 6 (Sunday) and Thursday 8. The final parade on March 13 will start at 5pm. The events required entry tickets.The Viareggio Carnival is really a funny (a bit crowded) event, enjoy a short video of one of its past masked parade. During next weekends in the beautiful area of Mugello, not far from Florence, several fun events will animate the characteristic villages of Dicomano, Vicchio (on February 26), Borgo San Lorenzo and San Piero a Sieve (on February 26). In Dicomano and Borgo San Lorenzo the appointment with the colorful masks and floats is on 20 and 27 of February and 6 and 8 of March. Carnival will celebrate in San Mauro a Signa, close to Florence, on 20 and 27 of February and in the historical center of San Casciano Val di Pesa on the February 20. The medieval San Gimignano, with its famous ancient tower-houses, will host a Carnival parade on 20 and 27 of February and on 6 of March. In Foiano della Chiana (not far from Arezzo) is organized one of the most ancient italian Carnival parade. This year the shows will take place on 20, 27 of February and on 6 and 13 of March. Entrance fee. Carnival confetti, masks and fancy costumes will fill up the historical center of Castelnuovo Garfagnana on 26,27 of February and 6 of March. These are only few of all the Carnival events you can join in visiting Tuscany in next weeks, you’ ll certainly find one close to you! 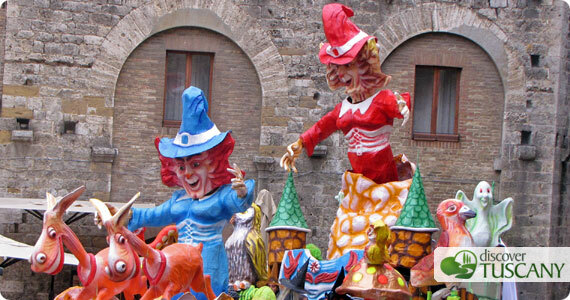 It’s time to dress up and have fun: enjoy the Tuscan Carnival!